More and more details are coming out about Google Glass. I spotted that Google has publicly posted the help documentation on how users should use Google Glass. You can find the how to use Google Glass documentation at google.com/glass/help. It shows you things like Getting to know Glass, how to Put Glass on, how to Connect your Glass, how to use the Home screen, basic Common actions and seeing your timeline. I am pretty excited since I am suppose to be getting Google Glass. A few months ago we told you about the Mirror API. It's how you develop Glassware, which is what we're calling Glass services. We know a lot of you are eager to learn more about it, and I have some great news. Today we're releasing the API documentation and a bunch of example code, so even though the API is in a limited developer preview, you can start dreaming with us. Google Glass should be in the hands of some Google Glass explorers as early as today. The I/O sign ups from last year got emails about getting Google Glass real soon. 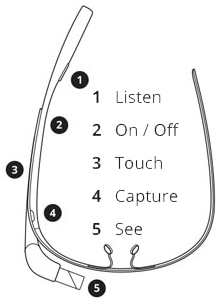 There is a lot of detail coming out on Google Glass today, see it all on Techmeme. Forum discussion at these two Google+ Google+ pages.